When I picked up the new Smith and Wesson M&P Shield .45 ACP, I was already a convinced fan of the Military and Police line. 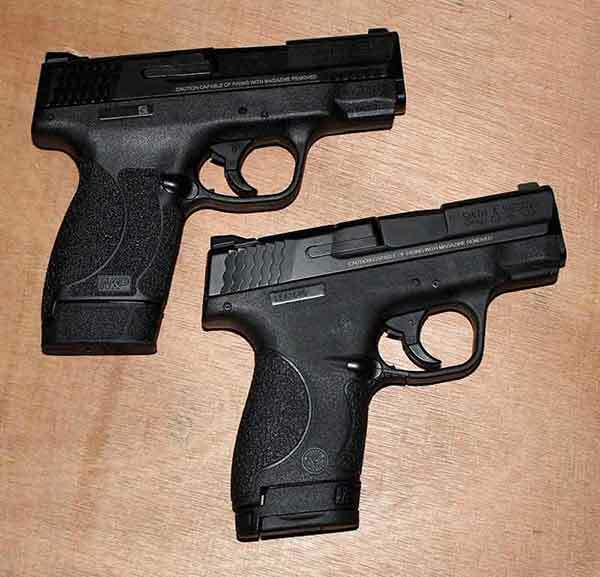 I have observed and shot the full size .40 S&W models, and reviewed them on this website. I own the Shield .9mm. And I know why it's one of, if not the most popular concealed carry gun currently on the market. 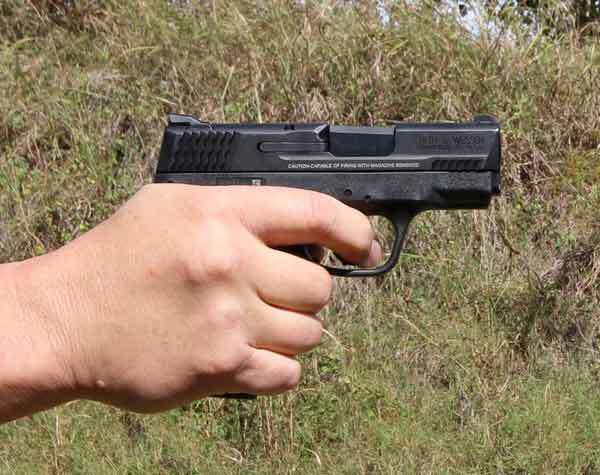 The gun is small enough to conceal easily in a variety of ways, but will provide a full grip for most people's hands. Left side controls on the new Shield in .45 ACP from left to right are the take down lever, slide release, and the flip up safety. 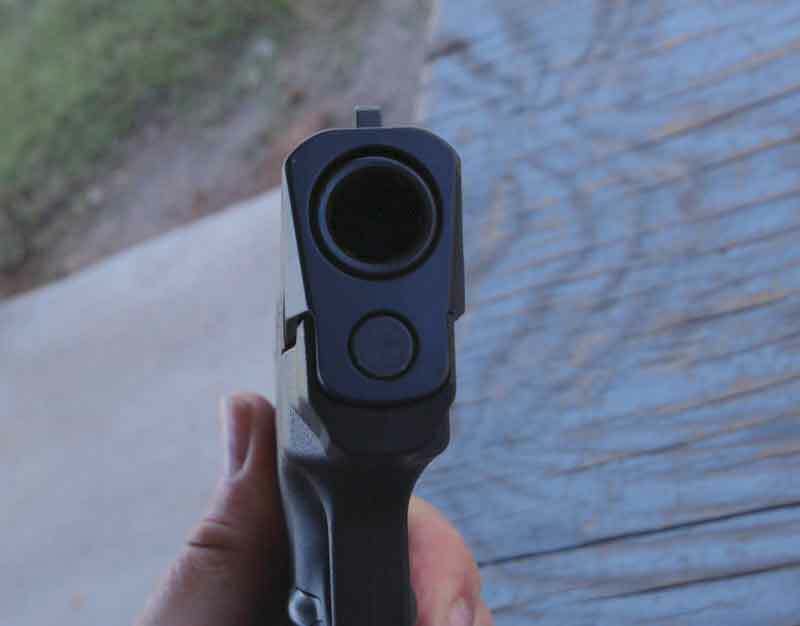 Below on the grip is the magazine release button. The safety is easy enough to use, but not terribly intuitive and not something I keep engaged when I carry the Shield of either caliber I own. The top view of the gun shows the sights, both inserted with dovetails. The rear one is also secured by a hex screw. The front sight is the only one presented as adjustable for windage only. I can say, if you have to adjust it, be ready to grit your teeth and do some pounding with a hammer and punch. There are cocking serrations on both the front and rear of the slide. 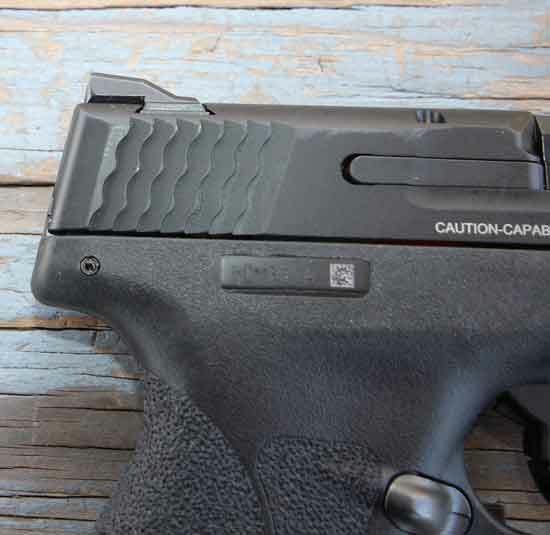 On the .45, one of the more talked about features is the new aggressive grip texture in the Shield grip. Not on. In. It's part of the grip itself, not something added to it. The upside to the grip texture is the legitimate "grabbing" effect it has on the skin of your hand when you grasp it. No slipping here. The downside is that when you've shot a couple hundred rounds through the gun, it feels like somebody has assaulted your hand with 80 grit sandpaper. 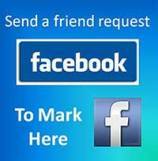 In all, it's a serious positive in the area of control. Just gets a little uncomfortable with extended shooting. For those finding the texture too uncomfortable, any number of thin rubber grip sleeves are available on the market to soften the surface. I would suggest not letting some discomfort with the grip determining your future with the pistol. 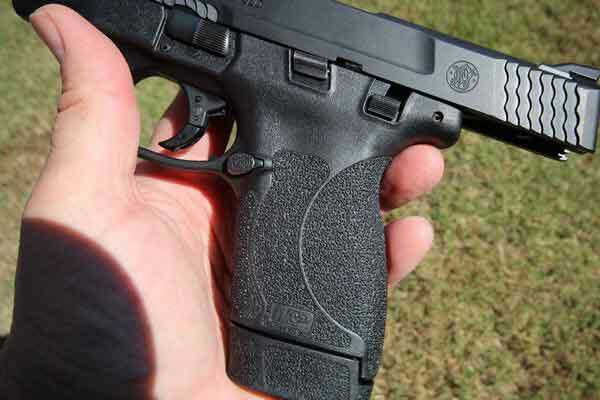 The M&P Shield .45 comes with two magazines, a 6 round, and a 7 round with extender to lengthen the grip. The gun will carry easily in an inside the waistband holster, belt holster, or pocket pouch for a jacket or coat. It is a bit big for an ankle holster, but it can be made to work. At this writing, there are not many holsters made specifically for the .45 model, but it won't be long with the anticipation of this gun reaching store shelves across the U.S. When I found the .45 in the dealer case, I had them take it out and hand it to me. That was it. In around twenty seconds I said, "Let me have one." I picked up 700 rounds of .45 ACP ammo packed in various casings to go with the reloads I had at home. 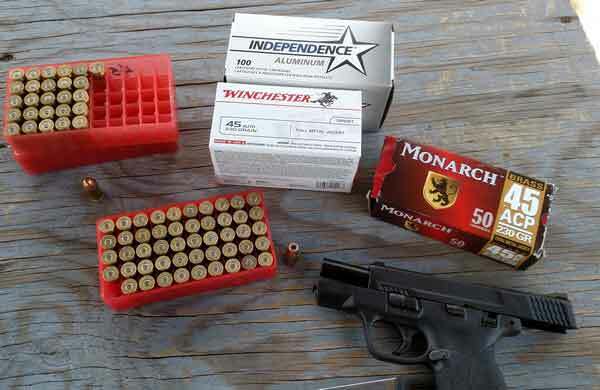 Next day, it was off to the range with the Military and Police Shield to see how the small gun handled the various ammo. From the model's reputation and my own experience with the .9mm I had high expectations. The pistol did not disappoint. With the full grip provided for my average size hand, the gun pointed naturally, with the sight radius easy to line up for target shooting. The textured grip was easy to hold securely with no slipping throughout the shooting session. All this is relative to the gun's size, and shouldn't be construed as magic. A gun this size will have some limitations for anybody. 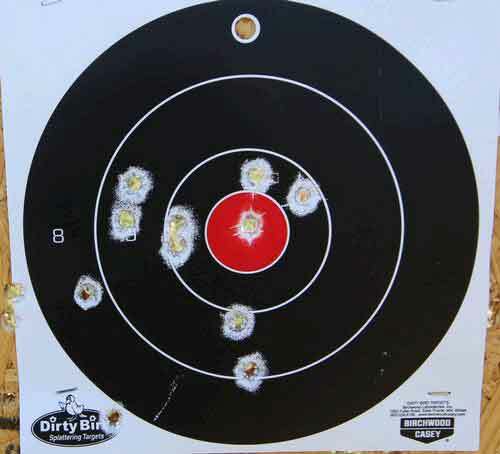 I started out with a little target shooting to check the gun for basic accuracy in off hand aiming. The gun performed as expected with factory, brass cased, FMJ ball ammo. Aiming, but fast firing, the diminutive .45 spit out the practice ammo with enough precision to fill the Dirty Bird target shown with confidence boosting holes. It was not a problem carrying on from there. Aside from that, defensive shooting, fast, moving, with several types of ammo let the Shield prove itself in dependability and performance through over 200 rounds. The gun firing, produced as expected with superb function, including one many people don't think much of until a handgun cartridge ejects, hitting them between the eyes. Not with this gun. 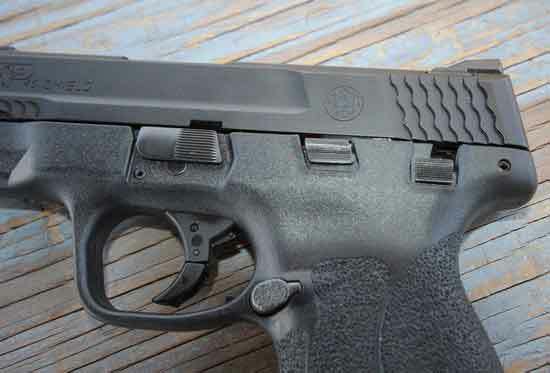 The Smith and Wesson M&P Shield .45 ACP is a winner of a concealed carry handgun. It's a gun that runs with the GLOCK in terms of pure performance and dependability. 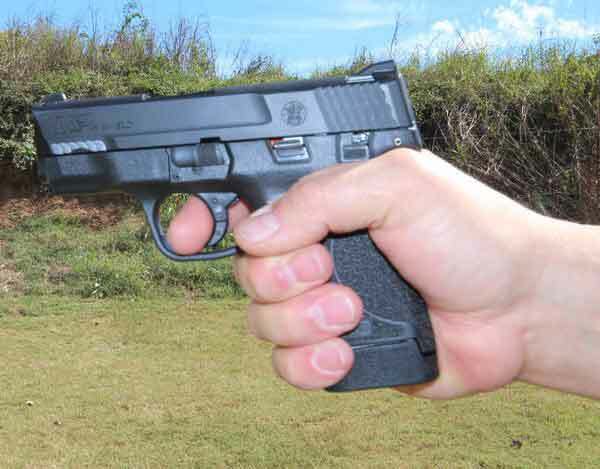 They have produced a gun that is easy to conceal multiple ways, but can be shot for extended periods of practice time without becoming too uncomfortable. That = it's fun to shoot. 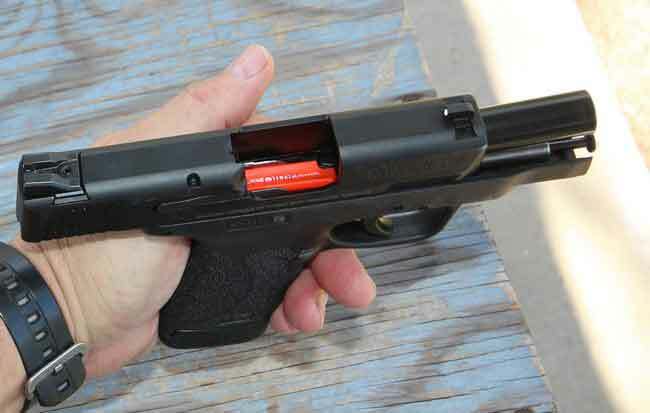 This picture shows how Smith and Wesson has taken the Shield model, in .9mm and produced a .45 ACP that is ridiculously close in dimensions to the nine. 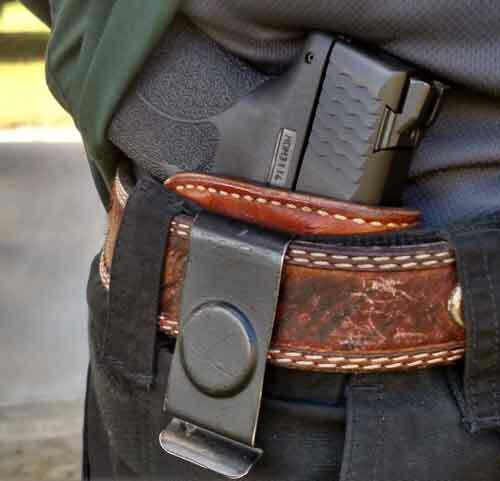 There's a reason the Smith and Wesson Military and Police Shield line of concealed carry handguns has become one of the most popular lines of pistols in the U.S. They've turned out a handgun that people serious about concealed carry and serious about performance, control, and accuracy can take hold of with confidence. As far as the .45 version is concerned, this is what a violent criminal would be looking down if you were armed with one. The Smith and Wesson Shield .45 ACP. Am I impressed? 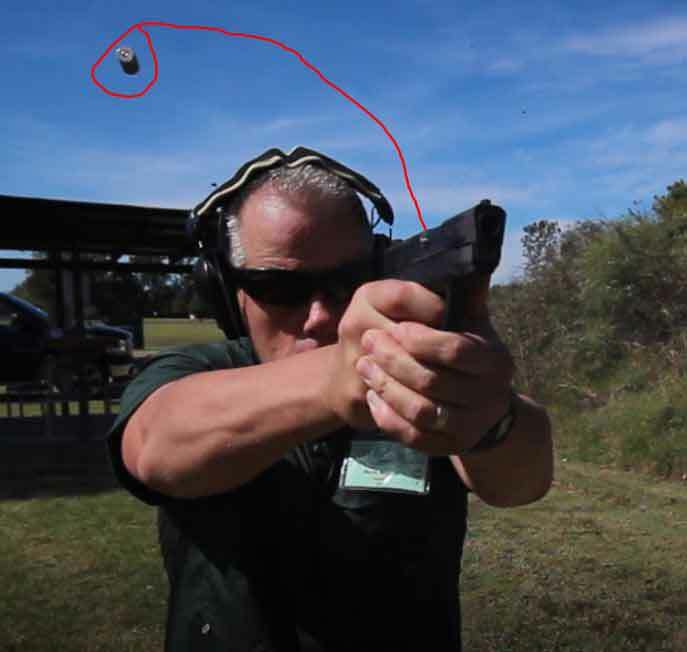 Before you go, here's a short training video of using a Para compact 1911 .45, followed by the backup Shield .45 ACP. This is a carry gun you can depend on. Go for it.